Westminster Abbey is one of the most recognizable churches in the world and certainly the most famous in Britain. Settled in 960, and built over hundreds of years, the church is the heartbeat of British Royal activity. Take a 90-minute, verger-led tour, which takes you through the Shrine and Tomb of Saint Edward the Confessor, the Royal Tombs, the Poet’s corner, the Cloisters and the Nave (£5 + regular admission, £20 for adults). Big Ben, located right at the edge of Westminster Bridge, is a perfect spot to snap an iconic "I was in London!" photo. Face the other way and you'll also get a great shot with the famous London Eye in the background. The 16-storey Gothic clocktower is a national symbol, located at the Eastern end of the Houses of Parliament. With a tinted red road to imitate the large red carpet at Buckingham Palace, take the Pall Mall route to Trafalgar Square for a hearty afternoon walk. The mall has Union Jacks lining the street up and down the path, and London's iconic black taxis and horse-drawn carriages passing you by in true vintage movie style. 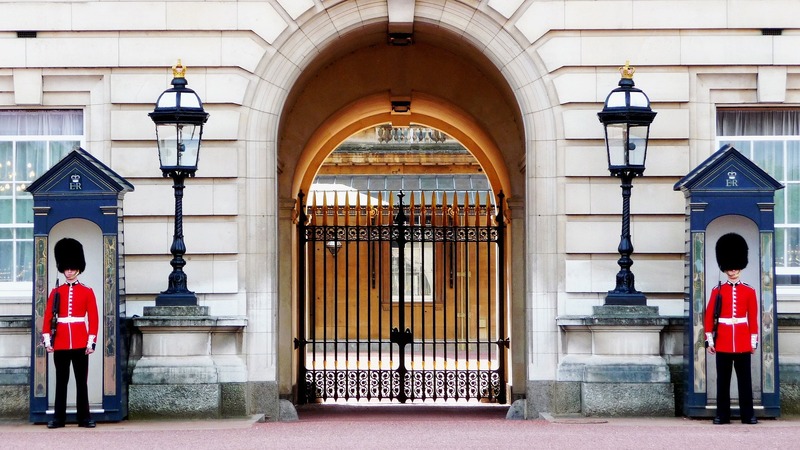 Take a gander at Buckingham Palace, the working headquarters of the Monarchy, where The Queen carries out her official and ceremonial duties as Head of State of the United Kingdom and Head of the Commonwealth. The famous "changing of the guard" takes place at 11AM every day, and the entire ceremony takes about an hour, complete with a live band of buglers. Make your way to Timmy Green for all things Aussie. The Down Under-inspired cafe features two stories of dining space and a lovely al fresco coffee bar, the perfect setting to chow down on brunch dishes and delicious drinks. Start with a flat white and a freshly squeezed orange juice; pair them with hearty yet healthy dishes from the standout menu. We love the banana bread sandwich with mascarpone and fresh berries, the avocado on charcoal bread with house-made labane cheese, and the vegetable fritters with poached eggs. The Science Museum is a seven-story interactive destination with mesmerizing exhibits that cover everything from early technology to space travel. Make sure to check out the new Wonderlab exhibit, filled with specially commissioned exhibits and artworks, live science shows, and explosive demonstrations. Other highlights include the Exploring Space gallery with genuine rockets, the Information Age Gallery that showcases communication technologies, and the Flight Gallery with hot air balloons. Admission fee of £8. One of London's most legendary venues. Even though the restaurant has been around for many years, step inside and you'll feel like you've been transported to a futuristic Alice in Wonderland -each room has a different fun theme. We love quirky afternoon tea in the Glade, or a few post-dinner drinks in the Parlour on a night out. To turn up the heat, head through the dining room to th East Bar, a small circular room with sunken bar and booming beats. A must-visit for tourists and locals alike, London’s Chinatown is teeming with dozens of restaurants serving food from just about every region of China. It’s also one of the most vibrant neighborhoods in the city, full of neon, decorated with pagodas and paper lanterns, bustling with people from all nationalities shopping for produce, sipping bubble tea, searching for souvenirs, or munching on kimchi buns at one of the many bakeries. A pedestrian-only plaza in the heart of west London’s theater district, Leicester Square is teeming with restaurants, shops, playhouses, and cinemas – so many cinemas, in fact, that this is where most of London’s big movie premieres happen. A-listers like Tom Cruise, Bruce Willis, Sylvester Stallone, and Sir Ian McKellen have all left their handprints in bronze here. The half-price ticket booth next to the John Hunter gate is a great place to score theater tickets. 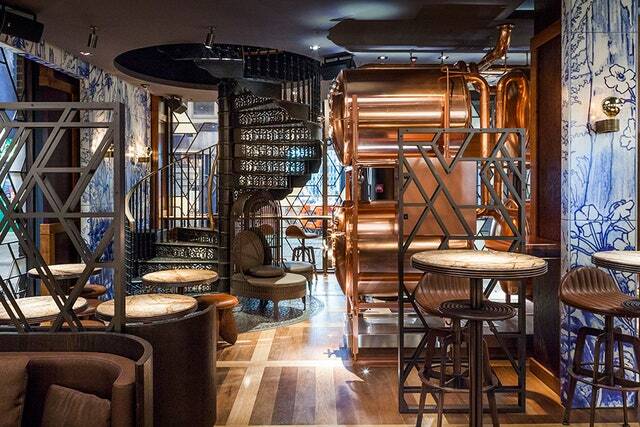 Located in London’s Chinatown, the Duck and Rice is a stylish two-story bar and restaurant known for great music, craft beer served from copper beer tanks, and an upstairs dining room that highlights progressive Chinese cuisine. While you can enjoy bar snacks like lip-numbing Sichuan chicken at the bar, the full-service upstairs kitchen turns out excellent dishes like Cantonese roast duck with crispy skin, wasabi prawns, and eggplant with preserved mustard greens.